Our annual regional parent conferences are a collaboration between Texas Parent to Parent, local parent groups, school districts, Education Service Centers, and others. Regional parent conferences are one-day events offering attendees a variety of breakout sessions, child care and outstanding resource fairs with some pretty terrific exhibitors. East Texas in late winter. Our speakers are the foundation of our conference - without our speakers, both parents and professionals, donating their time and travel expenses, our conference would not happen. We will be accepting Speaker Proposals for our 1-day conferences about 3-months before the conference. 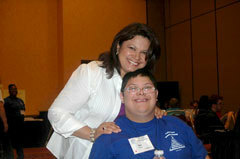 If you have any questions about being a speaker, please send an email to speaker@txp2p.org. Sponsors partner with TxP2P in order to improve our conference programming and outreach so that more parents will receive the knowledge and assistance they need to effectively advocate on behalf of their children. Earn recognition for your organization and help Texas families at the same time. Sponsorships are available at a variety of levels, and each comes with recognition options. Learn more about conference Sponsors.